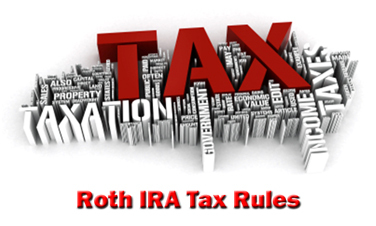 What are the Roth IRA tax rules? Is all the money you withdraw in retirement tax-free? What about conversions? And what's the five year rule? And you need to know the answer. Knowing the tax consequences of each of these events can make the difference between a good Roth IRA experience and Roth IRA nightmare. After all, you don't want the IRS knocking on your door and demanding payment of back taxes or penalties, do you? Contributions to a Roth IRA are non-deductible, which means you fund your Roth IRA with after-tax dollars. So essentially, Roth IRA contributions are taxed. Let's say you invest in a traditional IRA and your income tax rate is 30%. You contribute $2,000 to your Traditional IRA, and your current salary is $40,000 per year. In this case, you fund the IRA and then pay 30% tax on $38,000. So you end up with $2,000 in your IRA and take-home pay of $26,600. Now, let's say you had invested in a Roth IRA instead. Since Roth IRA contributions are non-deductible, you fund your Roth with after-tax dollars. So first you pay 30% income tax on your $40,000 salary, leaving you with $28,000. Using $2,000 of the $28,000 in after-tax dollars to fund your Roth IRA, you end up with $2,000 in your Roth IRA and final take-home pay of $26,000. Hey, I ended up with more take-home pay funding the Traditional IRA over the Roth IRA. But remember, there's no such thing as a free lunch. Your traditional IRA contribution isn't taxed now, but it will be taxed when you go to withdraw funds in retirement. You NEVER pay taxes again! Normally when you sell a stock, rental property, or other asset for a profit, you incur some sort of tax liability. But most retirement accounts offer great tax advantages in this respect. The Roth IRA is one of them. ...on interest, dividends, royalties, capital gains, or any other investment income you manage to generate during the time your Roth IRA is open. Make sure to follow the rules! You don't have to worry about either one of these if you withdraw an amount equal to or less than your original Roth IRA contribution. But if you withdraw the investment gains on your original contribution before age 59 ½, then those gains are subject to both income tax and the ten-percent early withdrawal penalty. For example, let's say you open a Roth IRA at age 28 and contribute $3,000. At age 35, you decide to close your account, but it's now worth $6,000. The original $3,000 contribution is withdrawn tax-free, because you already paid income tax on that money before you funded the Roth IRA. This is your original contribution or your principal investment amount. But the $3,000 investment gain on that contribution is subject to both income taxes and the 10% early withdrawal penalty. $300 for the early withdrawal penalty. So out of the $6,000 in your Roth IRA, $1,200 goes to taxes and penalties, leaving you with $4,800. Only 80% of the funds in your account. There are certain exceptions to this rule, but they're rare. So we won't address them right now. Just know that, for the most part, you're going to have a hard time avoiding taxes and penalties if you try to withdraw Roth IRA investment gains before age 59 ½. It's the 5-year tax holding rule. In essence, it means that before withdrawing tax-free funds from your Roth IRA, those funds need to be invested for at least five tax years. All right. So what does that mean? Let's say you open a Roth IRA in 2004 at the age of 57 and contribute $4,000. If you try to close the account in 2007, you'll still owe taxes on any investment gains generated on the original $4,000 contribution, even though you're 60 years old. Because the 5 year tax holding rule hasn't been met. In this example, you need to wait until January 2008 before you can withdraw your Roth IRA investment gains tax-free and penalty-free. Why 2008 and not 2007? Because after 2008, you've met the 5-year tax holding rule... 2004... 2005... 2006... 2007... and 2008. The rule applies to five consecutive tax years, not actual years. Find that hard to follow? Let's say you want to make a $3,000 contribution toward your 2008 Roth IRA limit. You make your $3,000 contribution for the 2008 tax year on April 1, 2009. Even though you actually made the contribution in 2009, in the eyes of the IRS, you made it in 2008. So your 5-year tax holding period begins its countdown starting in 2008 not 2009, because 2008 is the tax year of the contribution, even though 2009 was the actual year of the contribution.